This is a magnificent 5 bedroom holiday home which can accommodate up to 10 people, close to Disney, with a large, south facing decking area with views of the pool and the trees beyond, where you can enjoy the sun all day. This peaceful setting makes it hard to believe that you are approximately 10 minutes from Disney and 20 minutes from other parks. Reunion golf course is two minutes away and five minutes to Champions Gate golf course. 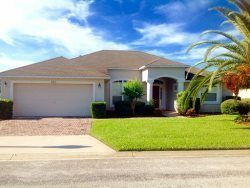 The home has a large balcony overlooking the pool where you can soak up the ambiance of what the real Florida has to offer. The villa is in excellent condition, fully air conditioned and is furnished throughout to a very high standard. The large deck area is private and is fully screened. The spacious family room is light and is comfortably furnished with a corner suite. There is a 50” HD flat-screen TV and a DVD player. The fully-fitted and well-equipped kitchen has a hob, oven, grill, microwave, dishwasher, fridge/freezer, plus a washing machine and tumble dryer. There is a master suite downstairs along with a master suite upstairs which houses a King Bed, the patio doors lead out to the balcony overlooking the pool and the treetops. Three bedrooms have their own televisions. The en-suite bathroom has his 'n' hers wash basins, a large oval bath, separate ‘wet room’ and wc. Two further bedrooms have Queen Beds and two have twin beds, there is also a family bathroom.